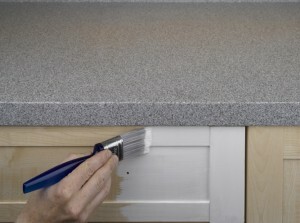 Nearly all kitchen unit surfaces can now be painted if you use a special primer to coat the unit surfaces first. 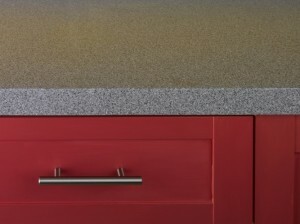 This can be an inexpensive way of revamping an old kitchen if you are on a tight budget. 1. Remove handles from all units and sand down the surfaces to paint. Wipe with a damp cloth to remove any dust residue and apply primer. 2. Once the primer is dry, sand surfaces again with a finer grade of sandpaper. Apply two coats of topcoat paint – eggshell is ideal. Again, you can sand between coats with a fine grade of sandpaper. When the paint is dry, refit the old handles or add new ones. If you decide to replace your handles, remember to fill and sand the old fixing holes unless your new handles require the exact same fixing holes. One of the best selections of handles and knobs in all colours and designs can be found in John Lewis. It is essential that the unit surfaces are as clean and grease free as possible before applying any paint. This entry was posted on Monday, August 9th, 2010 at 2:57 pm	and is filed under 'How-to' Guides, Kitchens. You can follow any responses to this entry through the RSS 2.0 feed. You can leave a response, or trackback from your own site.